D.P. Nichols; George W. McNear; Quinsler & Co. Chauncey Thomas & Co.
Three early Boston automobile body builders, George W. McNear, Quinsler & Co. and J.P. & W.H. Emond, share a common ancestry. The focus of this article focuses on J.P. & W.H. Emond, and William H. Emond's later career as the H.H. Franklin Mfg. Co.'s chief body engineer and designer. McNear was a continuation of the firm of Quinsler & Co., a firm originally founded in 1870 as Emond & Quinsler. Quinsler’s first factory was located at 1624 Washington St. on the corner of W. Concord St. near the present day Boston Medical Center. Born in September, 1844 to two German immigrants living in Canada named Johanas and Anna Quinsler, George J. Quinsler was apprenticed to a Boston carriage builder, after which his great skill came to the attention to another Canadian-born coachbuilder named Joseph P. Emond, (b. 1835) who brought him into his long-established firm, making him a partner sometime around 1870. Joseph P. Emond was born in 1835 in Quebec, Canada to Joseph and Elizabeth Emond and after a public education made his way to Boston, where he was apprenticed to one of the city’s numerous carriage builders. By the time the Civil War started he had established his own carriage works, and in 1870 entered into a partnership with George J. Quinsler. Joseph P. Edmond married Elizabeth A. Woodman at about the same time he established his carriage works and to the blessed union was born a son, William Homer Emond, who was born in Roxbury, Suffolk County , Massachusetts on November 29, 1861. Joseph P. Emond’s first wife, Elizabeth A. (Woodman) Emond passed away while William H. was a youngster and he subsequently married Mary E. Baker (daughter William M. and Sarah T. Baker) on August 7, 1871 in Boston. His occupation was listed as carriage mfr. on the marriage certificate and his son William H. Emond was 9 years old at the time. George J. Quinsler was married in Boston in October 11, 1876 to Antonia G. Marten (b. April 1852) and to the blessed union were born Geneveve M. (b. Aug., 1880) and Phillips B. (b. Aug., 1888) Quinsler. 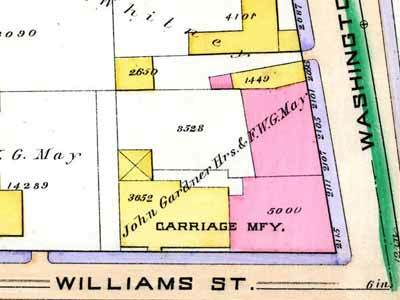 The partner’s carriage factory was located in the Boston, Massachusetts borough of Roxbury at the corner of Williams and Washington Sts. 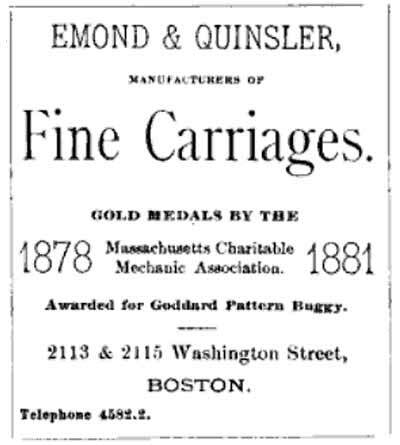 The 1875 Boston directory lists the firm as Emond & Quinsler. “65. Emond & Quinsler, Boston, Mass. — One Open Wagon. — Neat and showy. 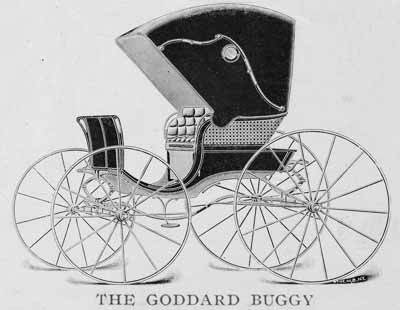 During the 1870s the Goddard pattern buggy, a drop front 4-wheel buggy designed by Boston’s Thomas Goddard, 146 Federal St., Boston (1861 address), was the most popular vehicle of the day, replacing the pre-Civil War two-wheeled chaise. An apprentice of Boston’s Walter Frost (b.1796), Goddard enjoyed an enviable reputation, and his hand-made buggies took a full three to six months to be completed, the majority of that time spent on their exquisite paintwork. 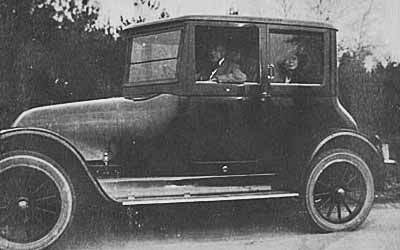 Goddard’s vehicles were considered to be the best of the best, and priced accordingly. Born in Cambridge, Middlesex County, Massachusetts on July 13, 1805 to William and Sarah (Warner) Goddard , he died in Boston on February 19, 1894 aged 88 years. Goddard retired in 1872, and Joseph F. Pray (b.1832-d.Mar. 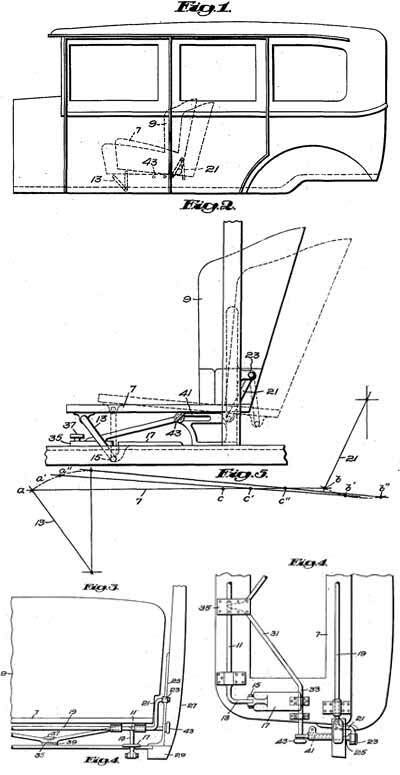 6, 1904) purchased his business and with it the right to produce the ‘Goddard pattern’ buggy. At the time, Pray Bros. Carriage Works was one of Boston’s leading vehicle constructors, have been founded by his father, Joseph C. Pray (b.1810-d.Dec. 4, 1890) in, 1845, whom he succeeded in 1863. By 1870 the number of Boston carriage builders numbered close to 50, and almost every one of them offered some type of Goddard buggy. Pray continued to employ most of Goddard’s staff, and soon erected a handsome brick manufactory in Boston’s South End at the corner of James and 32-36 East Concord sts. built with the financial assistance of his brother, Benjamin (b.1839) who had become a successful commission merchant. Although it was extensively remodeled into 26 condominiums in 1987, the Pray Bros. factory still retains most of it original looks. Perry’s 1875 Boston Directory lists Chauncey Thomas & Co. and D.P. Nichols & Co. as before, but reveals 2 new firms, Emond & Quinsler (Joseph P. Emond and George J. Quinsler) located at 2 Williams st., corner of Washington; and Sears & Nichols (Henry C. Sears & ?? Nichols) at 1785 Washington. “EMOND & QUINSLER manufacturers of FINE CARRIAGES. 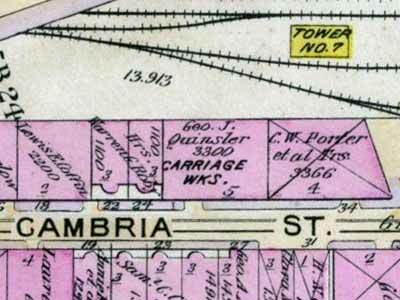 George J. Quinsler left the partnership at the end of 1883, establishing Quinsler & Co. at 26-34 Cambria St., just across the street from the present-day Berklee College of Music. Joseph P. Emond not only retained the partner’s 2113-2115 Washington St. factory, but kept the trade name until 1889 when his son, William H. Emond, became a partner. “44. 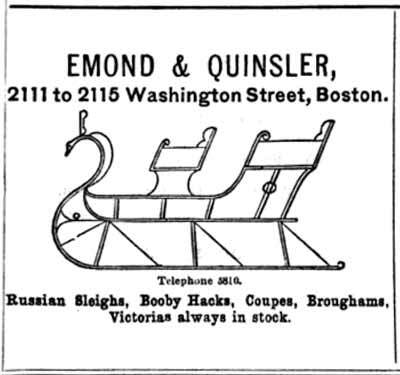 Emond & Quinsler, 2113 Washington St., Boston.— Goddard-Pattern Buggy, Brougham, Double Sleigh, Two-Seat Wagon (with original design in back of front seat), Top Box Buggy, and Phaeton. — All of good workmanship and style. Diploma. “83. Emond & Quinsler, Boston. — Trotting Wagon, weighing only eighty-five pounds; two Goddard Buggies, Beach Wagon and Double Sleigh. — Good style and workmanship. Special diploma, affirming award of Bronze Medal made at a former exhibition, for continued excellence. The 1890 edition of Clarke’s Boston Blue Book lists a J.P. Emond on Centre St., next to the Dorchester Industrial School (incorporated ‘for the purpose of training to good conduct, and instructing in household Iabor, destitute or neglected girls.’), in the southern Boston borough of Dorchester. William H. Emond was married in Boston on October 29, 1891 to Hortense E. Shaw (b. 1867 in Roxton Falls, Conn. to William & Elizabeth Shaw). Unfortunately Hortense contracted cerebral Meningitis in July of 1893 and within the week was dead, passing away on July 16, 1893 at the age of 26. Emond remarried in Boston on Nov. 1, 1898 to Bessie L. Wood (daughter of Lyn P. and May E. (Jack) Wood. “The Carriage Builder and the Automobile. “BY WM. H. EMOND, OF J. P. & W. H. EMOND, BOSTON, MASS. 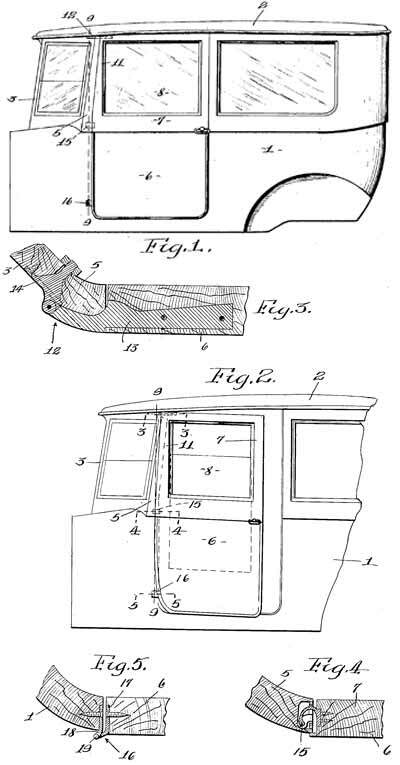 “[note.—Believing that those members of the vehicle building industry who have for various reasons not taken up the work of autobody construction in addition to their regular vehicle lines would be interested in hearing from those who have done so, and made a success of it, The Carriage Monthly recently called upon several members of the profession for an expression of their views as to the carriage builder's fitness for automobile body construction, and why carriage builders should take up the work. In response, we have received some very interesting and instructive replies, which furnish the trade with much food for thought, and we take pleasure in publishing herewith the first article of the series which is written by Wm. H. Emond, Boston. “There are two primary reasons why the builder of high-grade carriages should be in the business of doing whatever he is equipped to do in the automobile line. First the carriage builder needs the automobile, and secondly, the automobile manufacturer needs the carriage builder. With two conditions indicating such mutual dependence, how are you going to, or indeed, who wants to, keep them apart? “Looking back to the horse-car days, and to some of us they seem not far away, when the car driver, spying you on the curb, thrust out his fist toward you with the index finger pointed heavenward, and shouted "Ride?" his appeal was to your laziness or your tired feet; never in any sense to your desire to get anywhere in a hurry. Many a time as a boy have I started even with a horse-car at the South End, and in a square heel-and-toe walk finished ahead of the car at Summer Street; and in later years, when the streets became more congested with the growth of the city, it would have been an easy task indeed. “In the days of the horse car, therefore, the business man, the physician and all others needing comparatively quick transportation, resorted to the horse and buggy, and the horse and buggy to them were as necessary as gas light and city water. It was this making of business vehicles that was the backbone of the business of the average city builder, even though he may have ranked high as a designer and builder of light and heavy pleasure vehicles. “With the coming of the trolley car, conditions changed. Rapid transit then became the chief feature of public service transportation. The business men found they could get about as quickly, or more quickly, without their business turnout, and even a considerable percentage of physicians cast aside their pride in their buggy as a part of their professional equipment, and got about more economically at least on the trolleys. In a comparatively short time approximately 75 per cent, of the business vehicle trade, and with it the profits, disappeared from the city carriage builder's business. Then came the automobile, and did to the swell trade what the trolley did to the buggy business. Under these conditions can there be any doubt of the carriage builder needing the automobile? “Now to consider the second reason. When the manufacturing of automobiles first began to be an industry in America, those mainly responsible for its promotion ignored the American carriage builder's art, experience and knowledge of applied mechanics, elements which subsequent events proved to be of vital importance. Detail after detail of construction designed by alleged mechanical engineers, and supposed to be superior for the purpose to the carriage builder's tried and proven devices, have been cast into the scrap heap and replaced with 'old-fashioned" construction. Who wants wire wheels, tubular-bed axles, loop-end springs, capecart top and rear entrance tonneau on a car to-day? What has taken their places? Wooden spoke "Artillery" wheels, which the carriage builder used on commercial trucks; solid forged axle beds which he could never replace with tubular construction; plain half side springs used with identically the same connections on caravans; a folding extension top, practically as designed by some American carriage builder at least fifty years ago, and a side entrance body with a common sense arrangement of seats. 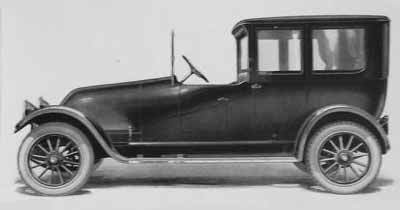 Perhaps the most comical of all cute contrivances of the cute automobile engineer was the rear entrance tonneau body. Awkward to enter, uncomfortable and dangerous when entered, the only possible excuse for it was as a makeshift on short geared cars, with the machinery under, or partly attached to the body; yet it became an accepted style of body as peculiarly appropriate for an automobile, and it even influenced the designing of side entrance bodies in respect to rear seat plan and general appearance. It was only the art of the carriage builder and carriage body designer that saved this monstrosity from becoming a perpetual earmark on the automobile. “J. P. & W. H. Emond in Bankruptcy. The bankruptcy proved to be a blessing for all involved, Joseph retired and William took a job as a body engineer and designer with the H.H. 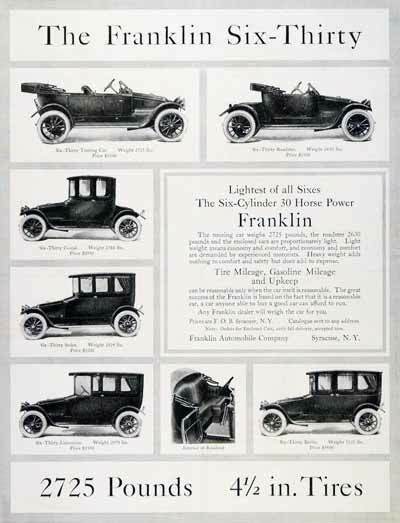 Franklin Mfg. Co. of Syracuse, New York. “According to W. H. Emond, chief designer for the H. H. Franklin Manufacturing Company, American manufacturers are beginning to realize the necessity of paying strict attention to the styles of design more than ever before. “Just before leaving for an extensive European trip to study foreign designs in motor cars, Mr. Emond said: 'I expect to visit a great many factories and a great many designers while I am away, but I shall pay particular attention to the work of Louis duPont, of the French school of coach design. He is, I believe, the greatest automobile coach-work designer in the world to-day. France undoubtedly leads in automobile coach designing with Germany second and England third. “The advent of the motor car has given the automobile coach designer a greater latitude than he ever possessed during the best days of the horse-drawn vehicle. In fact, the automobile coach designer is just entering upon a new field of labor. So much time has been spent in perfecting the modern gasoline motor and applying it to the automobile that little attention has been paid to beauty of lines until within the past two years. “Meanwhile, foreign makers have been devoting almost as much time to body designing as they have to motor perfecting. As a result they are far ahead of America in beauty design." “What Mr. Emonds says is true. The Hub has had much to say on the same subject when it was a very lonely minority of one. The American journals interested were very optimistic about all matters American, but failed to be discerning beyond the tips of their noses. We expect to hear the news now in many keys since the trade tuning fork has sounded a key-note. “This is a pertinent place to call attention to the possibilities of our Technical School for Carriage Draftsmen, and the aid it can render to those groping for style and individuality of expression in wood and metal. “The descriptive phrase stream line as applied to body shapes is borrowed from England says W.H. Emond Franklin body designer. ‘The Englishman is pretty clever in coining or applying characteristic descriptives to his productions. For example he does not call a single compartment closed body by the meaningless name Sedan, he calls it a Pullman, because to his mind the single compartment suggests an American one compartment Pullman railway coach as distinguished from the English coach made up of a series of compartments. “’The term ‘stream line’ was originally applied to bodies only but the American adapter employs it whenever he makes an attempt to run body and hood lines together. If he really did this and did it right, he would have a truly stream line effect but his efforts have been confined to putting a little slant and back flare in his engine hood and strenuously bumping his cowl so as to get a flush joint between hood and cowl. The rest is advertising. “W.H. Emond in Gas Power. - The important practical function of an automobile body is to carry passengers comfortably. 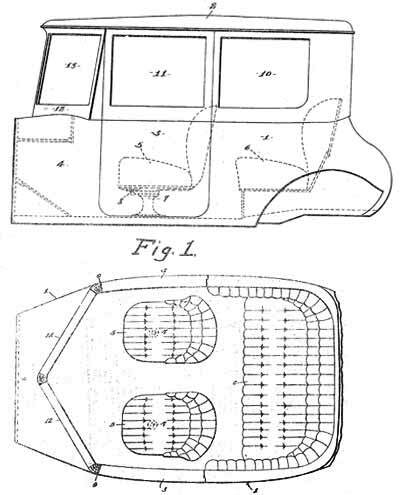 To obtain passenger comfort, dimensions must be right for normal human beings, cushion springs should be so constructed as to carry their load without bottoming on rough roads, and back upholstery must be so shaped as to conform to the human figure, relieve it from severe shock, and make it unnecessary for the passenger to repeatedly shift about on a long ride in an effort to obtain an easy position. This last is the real test of upholstery design. “There is, however, besides the mere body dimensions and besides the relative merits of different spring suspensions, a still more important element for consideration in designing a car for riding comfort, and that is the general assembly taking into account the distribution of the weight above the springs and axles - to make it plain, the position of the wheels with reference to the load both of passengers and machinery. “For the benefit of the engine and for ease of steering assembly, designers found years ago that it was essential to place the front wheel well forward; usually, in a water cooled car, on a line with the front of the radiator. For a similar consideration of passengers, European assembly designers are today placing the rear wheel well back and the body designer, who in Europe is largely the assembly authority, also contributes further to comfort by keeping his passenger load well forward, allowing of course generous foot room but no more. 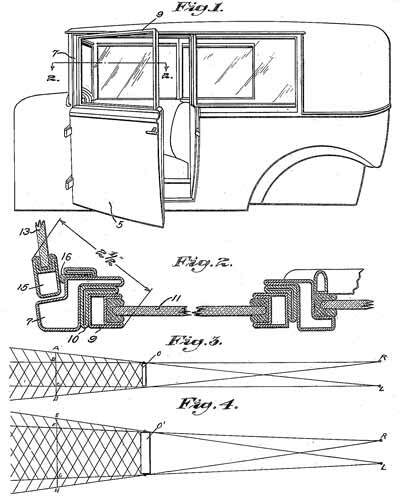 “The manufacturers of many American cars seem not to have considered this matter of general assembly design at all, so far as passenger comfort is concerned. The method seems to have been to place the front wheel according to accepted practice, then to make up their minds they will produce and advertise a certain number of inches wheel-base, and, on a chassis so designed, place a body with a long tonneau compartment which projects the seat load far back of the rear axle. “It is no wonder that a car so designed will completely use up its passengers within two hundred miles on just good average roads, even without considering the spring suspension. Every rough spot will throw the passengers off the seat at a speed of twenty five miles, and yet this long, roomy tonneau is featured as of great benefit to the prospective buyer. There is plenty of room for suit cases and other baggage in the tonneau, forward of the passenger's feet - in fact, the luggage has the most comfortable spot in the body while the passengers are tossed about in the overhang. “In the old Guild days, master and apprentice with router, draw-knife and beading tool, created by patient handwork the forms and decorative detail that have come to be recognized as classic in the coachmaker’s art. The forms endure, but chiefly as artistic conceptions for their use has been all but abandoned in the monotonous level of a machine-made age, says W.H. 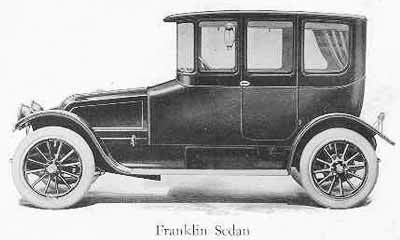 Emond, chief body engineer of the Franklin Automobile Co., at Syracuse, N.Y.
“The reason is steel fabrication and the unit efficiency of mass production, asserts Emond. Only the manufacturers of fine grade automobiles are clinging to the ideals of the Guild workers. 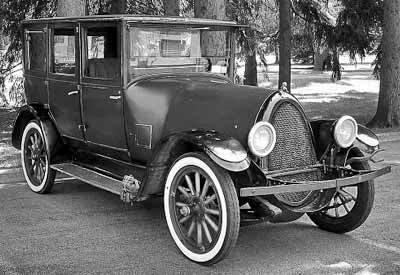 “One of the most attractive combinations of the ancient coachmakers," he says, "was the double reveal and the overlapping quarter panel with narrow bead back from the edge. “This combination was handed down from generation, even to modern times, but to reproduce it in metal-clad automobile bodies has generally been considered too expensive. “Clear Vision on All Models. 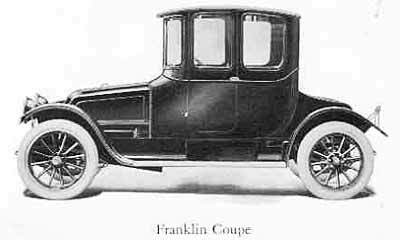 Although most of Franklin’s coachwork was built by the Walker Body Co., in Amesbury, Massachusetts, most of the engineering and design was completed back in Syracuse by Emond and his assistant Harry Strong. 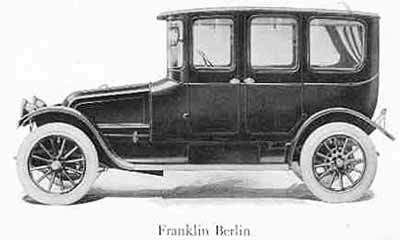 The pair were responsible for Franklin’s coachwork from 1910 through 1926 (Series 4-Series 10) when J. Frank deCausse was brought in as an independent styling consultant by Franklin’s Custom Body Dept. head, K.C. Haven, and its head of sales, M.K. Ledyard. Emond worked very closely with deCausse, who remained in his Manhatttan studio while Emond and Strong finalized the new Franklin's body engineering in Syracuse. Protoytpes were constructed by Willoughby in nearby Utica for pending final approval, after which series production commenced in Amesbury. Through their tenure with Franklin, Emond and Strong made periodic trips to Amesbury to check on the progress of new body styles and to ensure that Walker’s quality control was in keeping with H.H. Franklin’s stringent standards. “By WILLIAM H. EMOND, Consulting body engineer, Box 308, Syracuse, N.Y.
“FREQUENTLY heard during National Show week were such remarks as: ‘They all look alike to me,’ or ‘After you have seen about four exhibits you have seen the whole show.’ These and similar comments unquestionably reflected the reaction to the general appearance of the cars. The poor salesman at the show who could not point out a wide belt molding, a curved front face of the corner pillar and a spliced-out drip molding, all in combination, on at least one of his cars, felt as if he had no automobile to sell provided he believed, as many do, that constant repetition spells fashion. “Paul Thomas at the S. A. E. semi-annual meeting, from the outside looking in, complained of 'slavish copying' and a 'deadly similarity.' In an address before the Metropolitan Section, Amos Northup, from within, while apparently agreeing with Mr. Thomas on the main issue, discreetly refrained from open criticism, but one could hardly follow his suggestions and be accused of copying anything now discernible. Mr. Thomas was openly critical while Mr. Northup merely suggested. In an article on Detroit appearing in 'Outlook' and 'Independent,' of Feb. 13, Matthew Josephson writes: 'The figure of the new motor car was a great improvement over that of recent years but all of the major companies had adopted the same style and given their cars similar eyes, hips and square foreheads.' He then goes on to explain how this came about, but is slightly off as to facts. “The so-named sedan is the typical American family automobile. When the word automobile was mentioned fifteen or more years ago, the picture in mind was an extension-top phaeton, usually called a touring car; today that picture is the sedan. The passenger car is a roadster or a coupe. Nobody ever calls them automobiles. These three types, with some variations as to the number of doors, comprise the great bulk of American automobile production and it is these three types, with special emphasis on the sedan, that reveal the 'deadly similarity' in body design. “Mr. Thomas in his address mentioned 'Modern Art' as applicable to exterior as well as interior, design. Mr. Northup lightly touched upon its use in connection with interiors only. 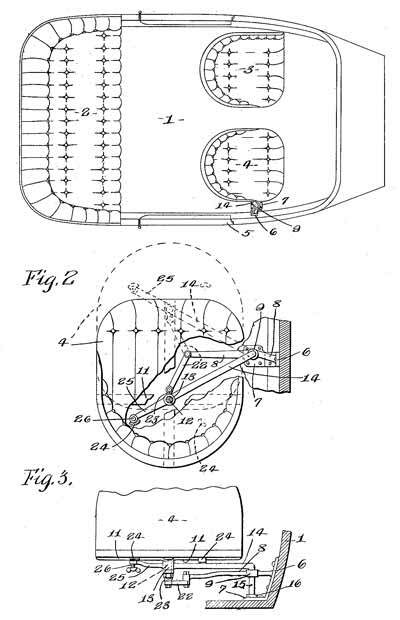 Mr. Thomas's criticism of passenger accommodations were hardly applicable to present-day well designed bodies and his suggestion of rearward- f acing intermediate seats is not an arrangement that a prospective purchaser would tolerate. Nevertheless, Mr. Thomas if taken seriously (and this is decidedly worthwhile) has given us much to think about: Fashion; Modern Art. “Mr. Thomas observed that many people think fashions are set by the manufacturer and thrust upon a sheep-like public. In prosperous years like 1928, so far as the automobile industry is concerned, this is largely the fact. It takes a little jolt of adversity, or prospective adversity to awaken the industry from the serene complacency for which the past boom year is responsible. The study of public taste and preference is a difficult matter when attempted in advance of exhibition. What the public will accept is a hazardous guess in any. line. However, certain trends in present taste are quite apparent and should be of assistance. Modern Art in its true artistic sense exhibits certain distinct characteristics. Its proper influence on interior design is acknowledged. Why not, as applied to closed cars on exterior design as well? “One of the characteristics of modern decorative design is simplicity and a preferential use of straight lines and angles. Mr. Thomas said that large, square windows make an ordinary sedan look static and lumbering. This is true if the emphasized rectangles approximate the square, but not where the length is much greater than the height. Moreover, all angles need not necessarily be right angles. Even in a flat front design a slanting shield, and quarter in harmony therewith, would dispose of the static effect. “The above observations apply for the most part to that portion of the elevation design above the belt, usually referred to as the superstructure. Thank goodness, we are still streamlining the main body and blending it more or less successfully with the hood surfaces, except in a few instances where the designer thought he had to do something to earn his pay and could think of nothing but queerly disposed fancy moldings and broken panels. “The superstructure is, after all, an important element in a pleasing design. Thus far it has mostly been treated only as an extension of the lower or main body surface with some holes punched in it for doors and windows. Why not treat it as 'a superstructure, keeping it light in weight and giving' the car a smart and speedy appearance, by rolling in the main body at the belt on a development from the cowl and hood, thus 'preserving the streamlining up to the superstructure? To be sure something in this line has been attempted on one or two production cars in this country; although a vast improvement over conventional closed-body design and meeting with popular favor, the results still preserve much of the old clumsiness and top-heaviness. In Europe they are doing it much better and have been for some time. “Mr. 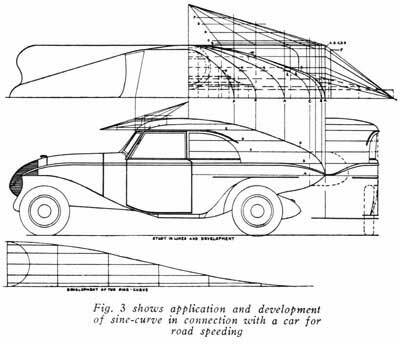 Thomas suggested a further development of the streamline principle to express more adequately in design the element of speed. Mr. Northup in his remarks concerning the treatment of the front end apparently has a similar thought. “So far as closed bodies are concerned it is difficult to design a superstructure to comport with this idea. A slanting V-front and the use of a sine-curve for developing surfaces back of the master cross section are about all that can be done and this type of car would only be suitable for road use. The sine-curve not only suggests speed to the eye and mind but actually accomplishes something in reducing skin friction and eddies. Without attempting to design a wholly practical body but to show the theoretical application of sine-curve development to a closed speed car, still employing fenders for protection against splashing but shaping and disposing them in such a way as to offer the least possible resistance to wind pressure, a study sketch is offered. The sine-curve in this study, Fig. 3, ends at point X on the elevation and the several horizontal sections, and the master line A is rounded in from X to the center line as a concession to expediency. If the sine-curve development, allowing room for two passengers on a rear seat, were continued to the center line, the surface would develop a keel as it approached the center and the overall length would be totally impractical for anything but a racing model. “It is interesting to note that the proportional development of the various sections by triangulation produces a sine-curve as far as X on every section, precisely as would happen if each section had been developed from the circle. This means that whatever virtue the sine- curve possesses in eliminating eddy drag is distributed over the whole surface. “Open-car models offer many better opportunities for variety and distinction in design than the closed models; and yet it is in this field that Mr. Thomas's complaint of deadly similarity is most emphatically applicable. American roadsters all look alike except for a few fancy moldings and applied gadgets. To be sure, the standard American roadster is a good-looking car, but they do not all need to look alike to be attractive; and while the present style. is admittedly smart and suggestive of 'speed, much more speedy designing is possible with a rational use of the sine-curve both in plan and elevation. 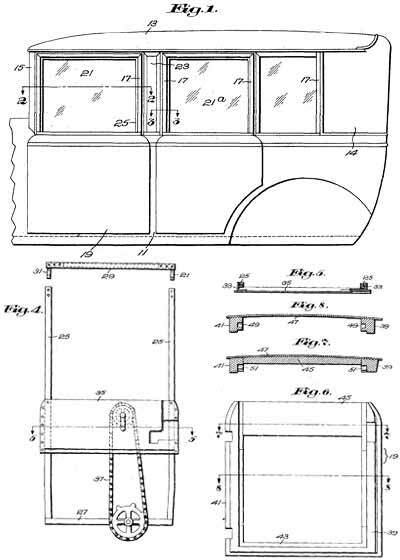 From the master section forward the ideal shape would, of course, be parabolic, but so long as fenders have to be treated as gadgets in the assembly line, not much more can be done with front-end development than is suggested by Mr. Northup. “Phaeton models as now offered in sales rooms present a greater variety in design than roadsters, yet here again the differences consist mostly of the cutting-up of side surfaces into variously shaped panels by the use of moldings. 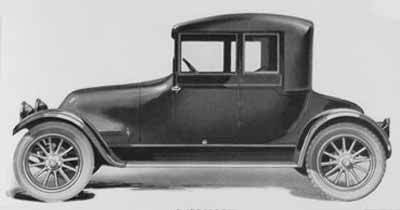 It apparently has never occurred to American designers to speed up the lines of the main body by leaving a long straightaway distinctly outlined, treating the seat rails as parts of a superstructure with an incidental splashboard effect that allows a clean-cut main body development to carry the picture. This style of body is attractive and perfectly practical, yet nothing of this character is being offered to the American buyer today. “It is by no means a certainty that a series of cars, practical, comfortable and comporting with the Modern Art movement would make an instantaneous hit with the public. Mr. Thomas is more optimistic in this respect than most of us feel. As an example, one member in the discussion following Mr. Thomas's address, cited the case of a certain car not needing a radiator cap that felt obliged to put on an imitation cap. This was done, not to add an artistic touch but because the public thought the car did not look like an automobile without an imitation radiator with a cap on it. Another instance is to be seen in some recent broadcast advertising where a certain make of car, calling attention to its marvelous accomplishments in inspired designing, mentions not less than four periods of ancient decorative art and incidentally drags in an extremely modern interpretation of an antique vase. All this in one series of cars. The question might be put as to whether the ad writer is right in his estimate of public intelligence. 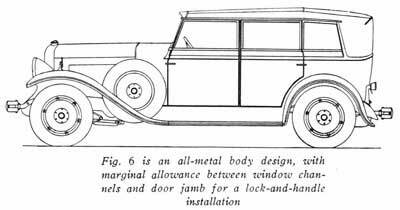 “Again, Walter Mitchell in his article in the February issue of AUTOBODY, gives us a glimmer of an idea as to what the wind would do, but he evidently favors the use of gadgets and fancy moldings. He likes the spliced drip molding, presumably because of what the wind would do; but in this case it isn't what the wind would do but what the water could do that should stimulate the mind of the designer. We might add more gadgets by placing a gargoyle at each end of the drip. The advertising expert could then make reference to another period of architectural design—the Medieval Renaissance. Mr. Mitchell may be a good example of average public taste. “Every good designer knows that the ideal motor-car design would eliminate fenders and streamline the whole car surface over and between the wheels, extending the overhang, front and rear, sufficiently for a contour that would reduce wind resistance to a minimum. Everyone knows that this type of car would not fit in with present parking problems, therefore would be totally unsuitable for city use. What might approximate the ideal and still be practical for all purposes under present conditions has been previously mentioned. More straight-lining and streamlining, less old-style coachwork detail, lightening of superstructure both as to appearance and actual weight, better outlook from closed bodies as part of the superstructure-lightening process. All these features would be strictly in line with Modern Art development and notwithstanding doubts heretofore expressed, one might venture the prediction that such designing would easily hit a note of fashion. “Mr. Thomas touched upon designing that would be distinctly appropriate to the particular use to which a car is to be put. Here is a field where the possibilities have hardly been scratched. The 2-car family is with us in the hundred thousands. We are hearing much about the 3- and 4-car family. Why not exploit the 5- and 6- and more-car family? In the days of horse- drawn vehicles every well-furnished private carriage house had an appropriate style of vehicle for every distinct use: At the shore or country place, a victoria for afternoon driving and general use; a family station wagon, a station omnibus or wagonette for meeting a party of week-end guests; large and small body breaks and a tandem cart for steeplechase, hunt or polo match, and so on; for city use, a brougham for shopping, the theatre and getting about; a cabriolet for driving in the park; a runabout for son; a gadabout for daughter and so on. It was as important to have the right vehicle for the particular purpose as to wear the fitting costume for the social function. “What do we see now, within and without the in- closure at a steeplechase, a polo match, a golf club or anywhere else for that matter? A lot of so-called sedans and limousines, fewer but quite numerous phaetons, and roadsters, all in their respective categories looking alike except for size and a few splashes of color. How can a sporting event look like anything but a city traffic jam under such conditions? Where is the snap and go to this sort of exhibition? “It would seem to be within the custom-body designer's province to start a change in this condition and yet he is only struggling along in a sharp competition with the same old types, only recently adding to his lines two or three kinds of convertible bodies (popular in Europe only because the purchaser deludes himself into thinking he gets two cars for one tax) which do not work and never will work satisfactorily. Herein lies the particular opportunity for the application of Modern Art interpretation to the uses and significance surrounding the problem in hand—the smart vehicle on smart lines—the staid and steady, more static—the outing and sporting types to look sporty and fast instead of merely tacking the word 'Sport' to the catalog name of a hackneyed design—the attaching of names that are descriptive either of the character or purpose of the car instead of using traditional coach- builders' names for vehicles not even remotely resembling their predecessors. The use, in a word, of simplicity and expression in design and the attainment thereby of attractive novelty." “By WILLIAM H. EMOND, Consulting body engineer, Box 308, Syracuse, N. Y. 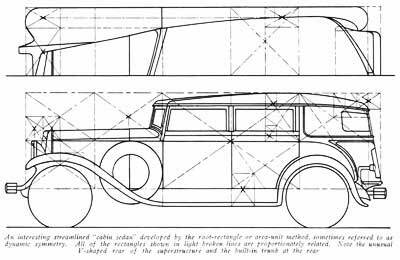 “In a previous article on the application of dynamic symmetry to automobile design, reference was made to the system of proportioning design by the use of area units—instead of line ratios—as having been used by the ancient Greeks. This was Hambidge's theory. Ernest Flagg in a recently published work on the Parthenon Naos laboriously proves that simple proportions were used in at least some Greek designing; and he goes out of his way to slap the Hambidge theory. A commentator has drawn attention to the fact that the proportions Flagg has so painfully demonstrated in connection with the Parthenon were used in planning the Great Pyramid. As a matter of fact all this was discovered years ago. There is no doubt as to the familiarity of ancient Greek designers with the properties of the root rectangles, and it would appear from some of Hambidge's analyses that the ancient Egyptians, from whom the Greeks got their start in geometry, had used area proportions in planning many architectural decorative details. “It seems easier to conclude that some of the Greek artists used area-unit proportions and others direct line ratios, and it is quite possible that each system had it advocates. Artists and human nature were likely much the same in 700 B.C. as today. Then it may have been the Statics vs. the Dynamics, as it seems to be now—with barbarians on the side lines sneering at both. If this were the year 700 B.C. and I were living in Athens, especially if automobiles were then being designed, I should certainly join the Dynamics. “To illustrate the difference between compositions developed from ordinary and from root rectangles, let us examine Figs. 1 and 2. Fig. 1 represents an ordinary line-ratio rectangle with the long-to-short-side ratio of 11:7. This is the base-to-height ratio of the Great Pyramid, yielding in its turn the "golden mean" ratio between slope line and half the base. For comparison let us take Fig. 2, a root rectangle with a height-to-length ratio of 1: √2, drawn to the same scale. This √2 rectangle has been found peculiarly adapted to automobile designing. “In Fig. 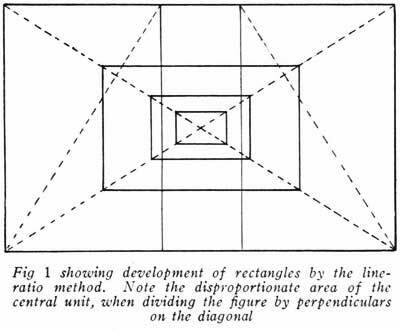 1 an infinite number of rectangles similar to the master figure may be developed on the diagonals, but if perpendiculars are erected on the diagonals it is found that the master figure is cut into two equal rectangles at each end but there is left in the center another which is not similar and hence cannot be used for the generation of rectangles similar to the master figure. If the master figure were a root rectangle, the perpendicular on the diagonals would divide it into two, three, four or five similar figures, according to the root number. It is evident therefore that the 11:7 figure has its limitations as compared to a root rectangle. “In Fig. 2 it will be noted that the perpendicular to the diagonal of the √2 rectangle cuts the long side of the master figure exactly into halves, thus allowing its division into two equal complementaries which of course have the same properties as the master figure. This is where it differs from the 11:7 rectangle. If, as in the side elevation of an automobile, the design composition has such functional proportions of length to height as to make it possible to cover the area by adjacent master rectangles and their equivalents, each equivalent or reciprocal and the whole area will be proportional to the master figure. “Let us now examine briefly the functions of the √2 rectangle. After dividing Fig. 2 into two complementaries, then quartering by a horizontal through the center, we have four reciprocals of the master figure. In the upper left quarter are shown, generated on perpendiculars, a series of rectangles which are in random arrangement and reciprocal with the master figure, but diminishing in area ratios. In the upper right quarter of Fig. 2, a series of exactly similar rectangles have been generated, coiled around an 'eye,' the point of intersection of the diagonal and perpendicular. The possibility of this arrangement of a series of rectangles thus generated around the eye is the excuse for referring to this system as 'dynamic.' Using the eye for a pole, one may describe about this coil a logarithmic spiral, the plan of shell growth. In the lower right quarter of Fig. 2 are a series of rectangles developed after the manner of Fig. 1; if an attempt be made to coil these around an eye it will be found that it cannot be done; this series then, and the proportions thus obtained, are described as "static." “In automobile designing, distinctly indicated area units are essential features of the composition. There is the main body and bonnet area, more or less interrupted by functional details, but distinct in spite of all the interruptions; then the area of the whole superstructure, subdivided by uprights into separate areas of glass and opaque panels; later, the disposition of mudguards, moldings and accessories may be determined geometrically in accordance with the master plan. It is the nice proportioning of these areas and details that make the satisfying picture. It would seem from the general character of the problem that a method of obtaining good proportions should be based upon areas, rather than line ratios, for the best effect. “In the accompanying study of a streamlined 'cabin' sedan, the whole height of body, from base line to top of roof, is the length of the shorter side of the basic rectangle, leaving the drop of the radiator shell below the base line of the body to be determined within a reciprocal proportion, treated as in excess. This is more in line with common practice. “The √2 rectangle with a long side of 70 in. has an indeterminate short-side dimension of approximately 49 1/2 in. The square root of 2 being 1.414 the ratio of the short side to the long is as 1: 1.414. The long side being 70 in., the short would thus be 49.498 in. The square root of 2 being indeterminate it will be better for the designer to construct the rectangle graphically rather than by scale. The dimension thus obtained is a perfectly practical dimension for the overall height of the main body, and for the proportioning of closed-car designs this √2 development is simple and satisfactory. “This body design has no static appearance whatever. It looks speedy, is speedy, and at the same time is built within a practical overall length for city parking. The superstructure is treated as a streamlined cabin. The V-front and V-back reduce wind pressure and eddy drag materially. The passenger compartments may be ample for five people and leave exceptional luggage space under the V-back structure. This part of the design is susceptible to a variety of treatments. In this case it is an imitation trunk. “Fig. 2 showing development of rectangles by area-ratio units. All rectangles in the upper left quarter have a definite area ratio. 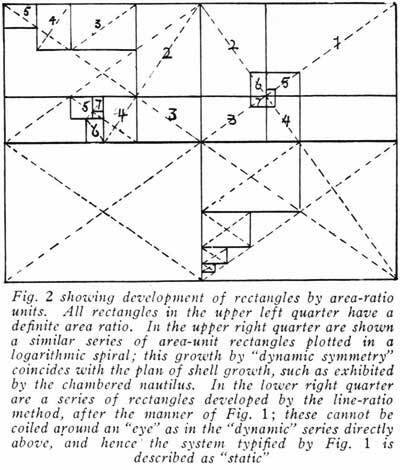 In the upper right quarter are shown a similar series- of area-unit rectangles plotted in a logarithmic spiral; this growth by "dynamic symmetry" coincides with the plan of shell growth, such as exhibited by the chambered -nautilus. In the lower right quarter are a series of rectangles developed by the line-ratio method, after the manner of Fig. 1; these cannot be coiled around an 'eye' as in the 'dynamic' series directly above, and hence the system typified by Fig. 1 is described as 'static'. 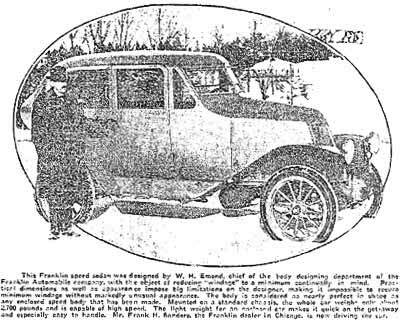 “William H. Emond, of Syracuse, NY, automobile designer and consultant on special problems in coachwork, is leaving this week for France, where he will persue his studies and specially observe streamline developments among the French coachbuilders, a field in which he has specialized for a number of years. Emond remained a consulting engineer until Franklin's withdrawal from the automobile business after which I could not locate any information about his whereabouts.